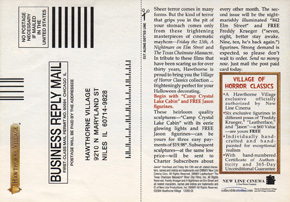 “Freddy Flashback” is a new website feature where we take a brief look at Nightmare on Elm Street inspired events or merchandise the public-at-large may have overlooked. Freddy Flashback is an evolving concept, so bear with us as we work out the kinks. We appreciate any feedback for Freddy Flashback, so please feel free to comment below or on Facebook. Sheer terror comes in many forms. But the kind that grips you in the pit of your stomach comes only from these frightening masterpieces of cinematic mayhem—Friday the 13th, A Nightmare on Elm Street and The Texas Chainsaw Massacre. In tribute to these films that have been scaring us for over thirty years, Hawthorne is proud to bring you the Village of Horror Classics collection… frighteningly perfect for your Halloween decorating. 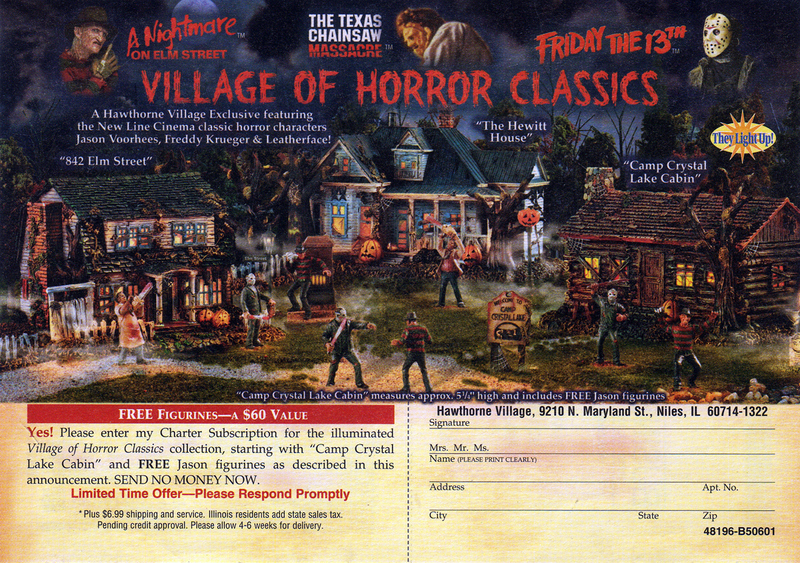 Begin with “Camp Crystal Lake Cabin” and FREE Jason figurines. These heirloom quality sculptures—”Camp Crystal Lake Cabin” with its eerie glowing lights and FREE Jason figurines—can be yours for three easy payments of $19.98. Subsequent sculptures—at the same low price—will be sent to Charter Subscribers about every other month. The second issue will be the nightmarishly illuminated “842 Elm Street” and FREE Freddy Krueger (“Seven, eight, better stay awake. Nine , ten, he’s back again.) figurines. Strong demand is expected, so please don’t wait to order. Send no money now. Just mail the post paid card today. Hawthorne later went on to develop houses based on other horror properties like Halloween and Dawn of the Dead. 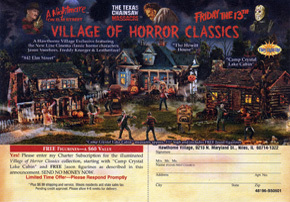 Unfortunately, the original Village of Horror Classics line is no longer being produced. Interested collectors and fans should check eBay for availability or other retail websites specializing in collectibles. 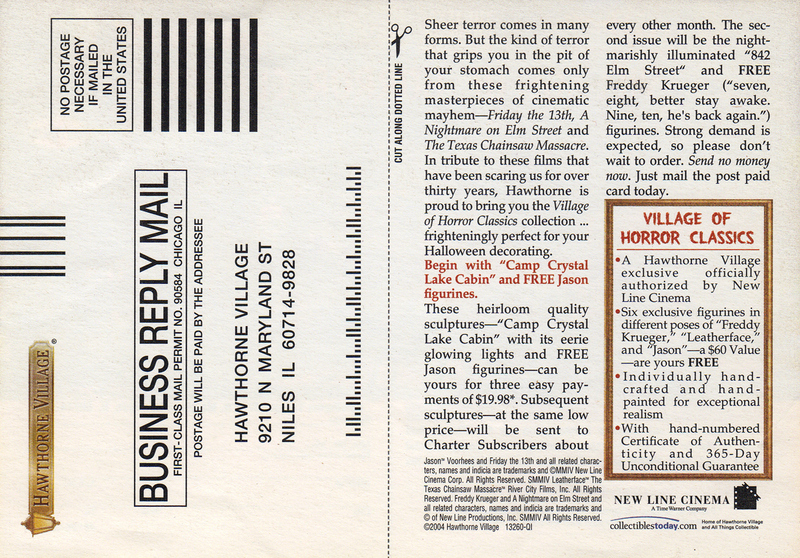 Do you own any sets from Hawthorne’s Village of Horror Classics? If so, submit your opinion of these collectables in the comments section below.